East Village in New York is probably my favourite neighbourhood. Not without reason: I lived here for a while and am not the only one who is fond of the place. Madonna, Lady Gaga, Lou Reed, Iggy Pop – they all lost their hearts to this part of New York City. 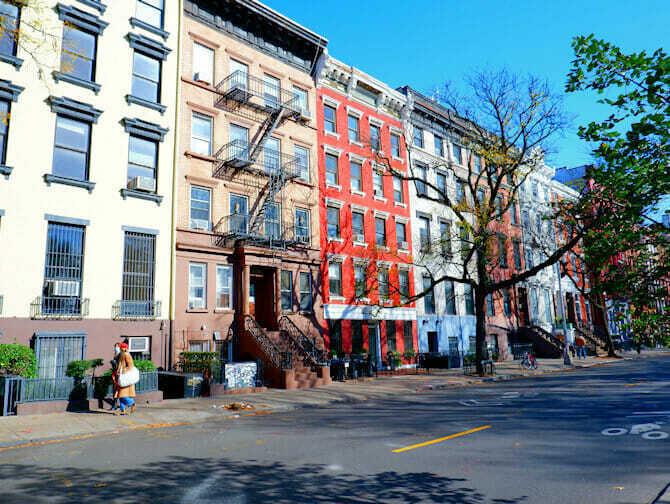 The East Village is characterised by its relatively low buildings and lack of big chain stores and tourists. 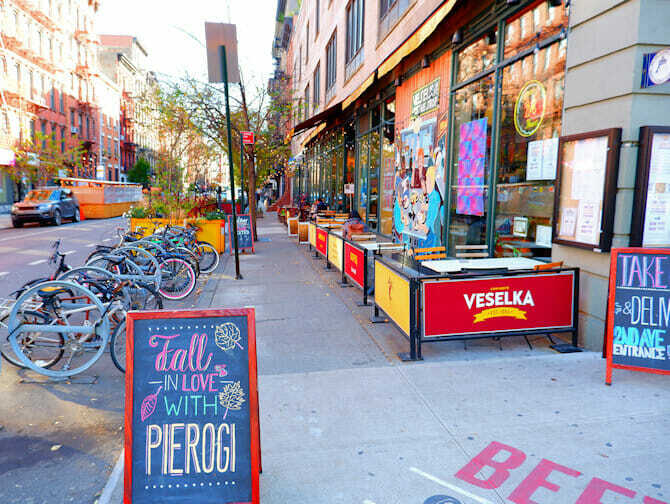 For you, as a tourist, it’s exactly what makes the East Village a great place to discover. 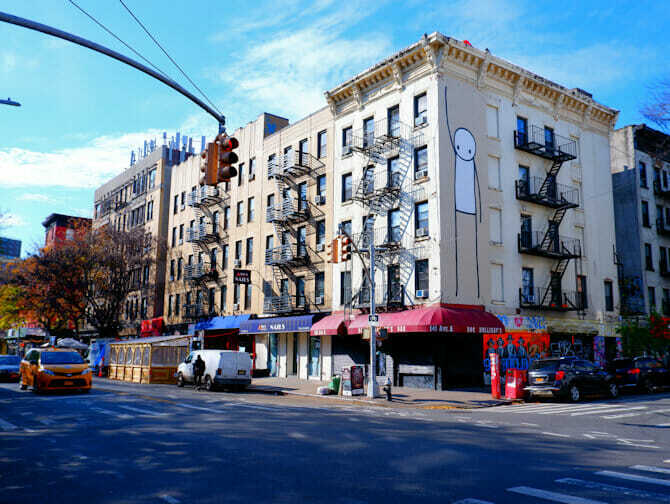 The East Village is considered to be the area east of 3rd Avenue and the Bowery to the East River, between 14th and Houston Streets. The East Village is a trendy neighbourhood, tailored to the many young people living here. Consequently, there are many small bistro’s, pubs and student bars where you can grab a bite or a beer at a great price. Tree Bistro is a cozy place with a personal touch. The family that runs it just love it when you come up to the bar for a chat. However, the true charm of Tree Bistro, where you pay fifteen to twenty dollars for a main course, is its beautiful patio. Another unique dining spot is Ikinari Steak, a Japanese steakhouse. Here you eat at tall standing tables. I had one of the best steaks I have ever eaten here, and the sauce is delicious too. St. Marks Place is basically the beating heart of East Village. This street, with its alternative shops and lively music scene, really nails the vibe of the neighbourhood. Here you’ll find a lot of record shops, selling rare records for a good price. Tompkins Square is also worth mentioning, you don’t need to spend a whole day there though: It’s mostly a place to grab a coffee before you move on. Alphabet City, formerly known as ‘Little Germany’, might sound familiar but is in fact just a residential area, where you will get bored quickly, if you spend too much time there. In any case, bare this in mind: the more you head towards the waterside, the less inspiring (and safe) the area is. 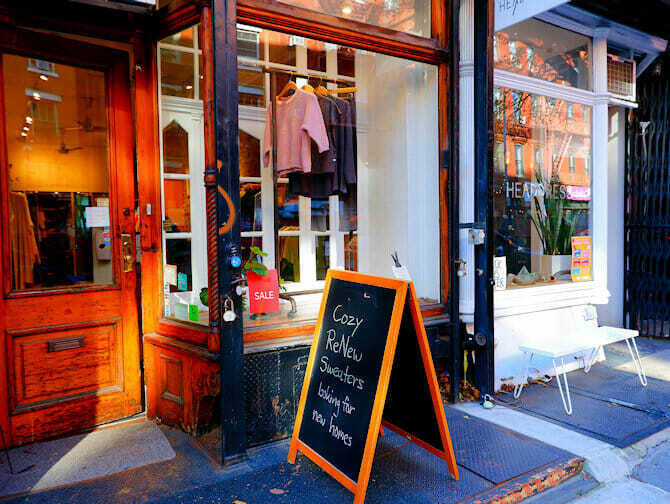 East Village is a great place to discover many original little specialty shops, as opposed to larger chain stores. Toy Tokyo, for example: a shop packed with Asian toys where you’ll really get a taste of Japan. If the sun starts shining unexpectedly? Head to Fabulous Fanny’s! This mini-shop sells sunglasses in nearly every imaginable shape and size. Whether you’re more of a Brigitte Bardot or a Kanye West, this is the place to find the right pair of sunnies. In case it doesn’t work out: the helpful staff will happily customise any of the frames for you. They can even add Swarovski crystals! Bike fanatics definitely need to check out Landmark Vintage Bicycles, where rare models can be found, alongside bikes from the 1930’s. I know it might be hard to take a bike home as a souvenir, but they also have lots of accessories. Eric’s Tip: If you’re looking for Houston Street: pay attention to your pronunciation. In the East Village ‘Houston’ isn’t pronounced ‘hew-ston’, it’s more like ‘house-ton’.